Personal injury lawsuits can take months or years to reach a settlement amount. Injured victims and their families experience mounting medical expenses during that time and may struggle to make ends meet if they’re unable to work due to the injury. Lawsuit loans were established for that very reason—We understand the financial burden the personal injury claim process puts on the plaintiff and their loved ones. However, it’s important to do your research before you sign with a pre-settlement funding company. Consult with Your Attorney. Your attorney most likely has experience working with businesses who offer these loans and may have partnered with a lawsuit funding company they trust already. Consider How Long Your Case May Take. Some auto accident cases may be settled relatively quickly if the crash was straightforward, but other types of personal injury cases such as medical malpractice can take years to close. Before you agree to a lawsuit loan, look into the long-term fees and interest rates. A Modest Loan Might be Best. Go over your expenses and determine the base amount you need to borrow to cover the costs of living in the interim. Make sure you won’t have to pay more than your settlement amount and that your loan is forgiven if your case is lost. It’s crucial you understand how your lawsuit loan works. Watch for Hidden Fees and Interest. While Legal Capital Corp doesn’t require an application fee, other pre-settlement lending companies may charge up to $400 to apply for a cash advance, regardless of the requested loan amount. Interest may be compounded monthly or at a higher rate than you realize. You may be stuck paying back triple the amount you originally borrowed. Lawsuit loans can help you cover your mortgage payments, car loans, medical expenses, and other costs while your attorney fights on your behalf. 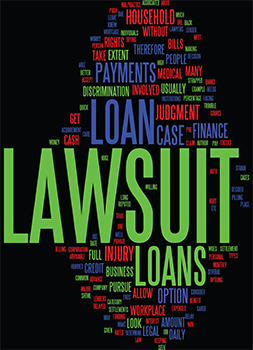 At Legal Capital Corp, we offer low, flat-fee financing for personal injury plaintiffs. Our application process is simple and free. We require a few documents from your attorney and approve or deny your application immediately, providing you with cash in hand within 24-48 hours of approval. If your case is settled within nine months, you pay a $600 flat fee and no more than $1,500 if your lawsuit is settled after those nine months. If you’re struggling to pay medical expenses and everyday bills during your personal injury lawsuit, Legal Capital Corp can help. Apply for a lawsuit loan online or contact us in Chicago at (312) 204-7939 to see if pre-settlement funding is the right choice for you and your claim.